Rich berry tones, classy tans, parisian prints and a dash of metallic drama; one can't help but go gaga over the eye catching items available at Accessorize India. 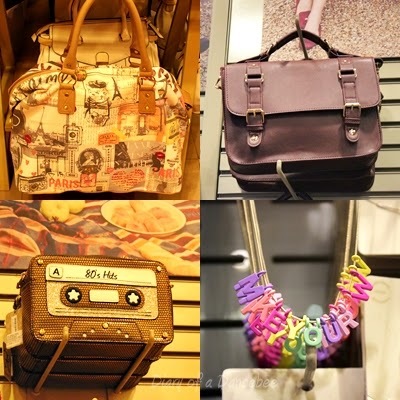 During a recent exclusive preview, we got a chance to feast our eyes on some stylish satchels, bag packs and trendy jewellery items among other things. What stood out for us were the prints and hues used in each of their five collections for the ongoing Autumn/Winter 2014 season. They were not your usual blacks and reds. Accessorize has dared to go all out with oxblood, brown, navy blue and even pop tints like pink. From an array of items that we loved, here's presenting our top five picks, that must make their way into your wishlist (and later the wardrobe) now! This spacious and stylish backpack is all you need to store your essentials on a long day out. This has to be our favourite. It fits in our iPad, camera and make-up essentials, all in one. Also, the shoulder straps are super comfortable. Quite a sophisticated handbag, this one. The oxblood meets gold elements instantly caught our attention. The push lock clasp with gold detailing is oh-so-classy! What's not to love here,eh? Right from the roomy compartments (quite spacious for a satchel) to the lovely floral print and finally, a touch of gold in those buckles. This one is a complete win-win. What's a perfect wardrobe without some pretty hats? These gorgeous fedora hats are just what you need to pair with your dress or a lovely winter outfit comprising of a skirt, jumper, coat and a pair of comfortable boots. Winter ready, are we? Hell Yeah! Your go-to accessory for the upcoming festive season, be it a Diwali get together or marriage. This just the right amount of bling that you need to add. Notice the floral detailing, with white, lilac and a host of other coloured stones? We think it is super cool. Check out some of our other favourites. As they say, a girl can never have enough favourite bags. Alright then! The new collection is available at all Accessorize India stores. You can also shop for your picks on Myntra and Jabong.